LTTE in Sri Lanka Using Thermobaric Weapons? 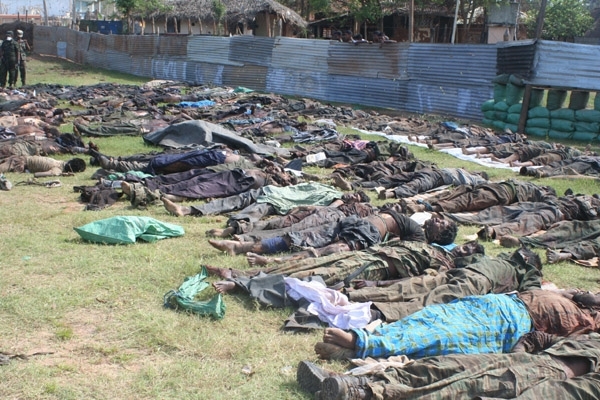 Re: LTTE in Sri Lanka Using Thermobaric Weapons? thermobaric weapon is a weapon which utilizes the heat (thermos) and pressure (baros) from an explosion to cause a long-duration shockwave which, in turn, damages the target. This is in contrast to high-explosive weapons which produce very sharp but very short-duration overpressure waves. Fuel, vaporized over a large cubic space, is exploded. Lasts much longer than HE (0.4 secs vs. under 0.1 secs HE) and so produces more burning effectivity and eats up oxygen in a vast cubic space accompanied by a vast pressure wave (making LOS to target obsolete). On large scale, an effect like a low yield nuke w/o the radiation. Thermobaric warheads operate by dispersing an inflammable mist, then igniting it. This produces an explosion that kills by sucking the oxygen out of the surrounding areas, as well as creating a powerful blast. Fired into a building, the thermobaric explosion would kill more people inside, and do less damage to adjacent structures. These warheads work better on caves than any other kind of weapon. Thermobaric warheads have been used with great success in shoulder fired rocket launchers. U.S. Troops have been using these for several years, as well as the Hellfire missiles so equipped. ATM they are generally estimated to be "inhumane" weapons (whatever this means). Exactly, is it more inhumane to be destroyed by a 7.62mm machine gun round or a shock wave?